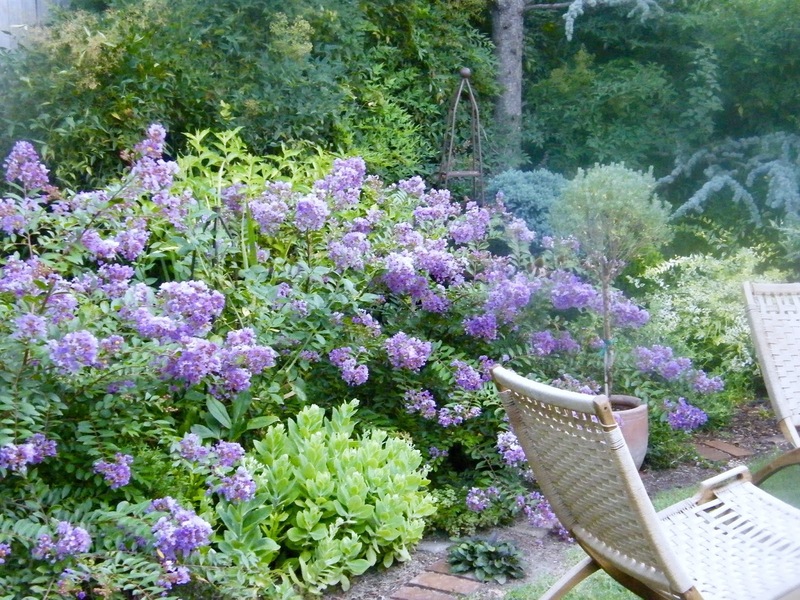 Woven garden chairs sit in front of border with lavender crape myrtles, sedums and conifers. 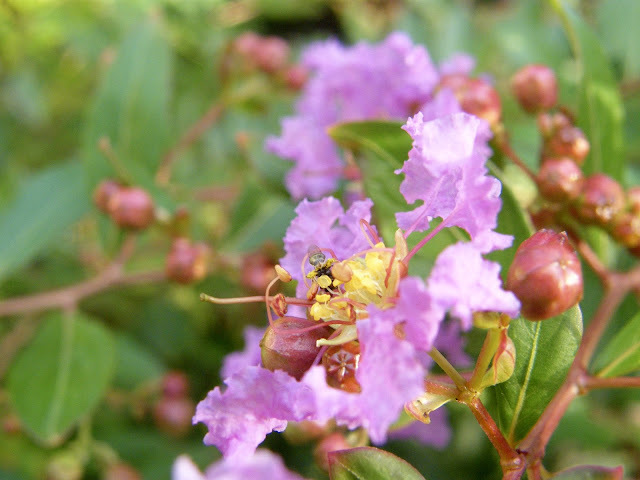 Three years ago, in an effort to introduce more seasonal blooming shrubs into my small landscape, I fell upon the EARLY BIRD Series of Crape Myrtles...semi-dwarf crape myrtles that promise to bloom earlier than older varieties producing intense color during the hottest part of summer. I found my EARLY BIRD Lavender at Home Depot as part of the SOUTHERN LIVING PLANT COLLECTION; on-line shoppers can find them at Wilson's Brothers Gardens. Lavender Early Bird Crape Myrtles from Wilson Brothers website. Intricate details of this lavender beauty on each bud and bloom are sure to please. 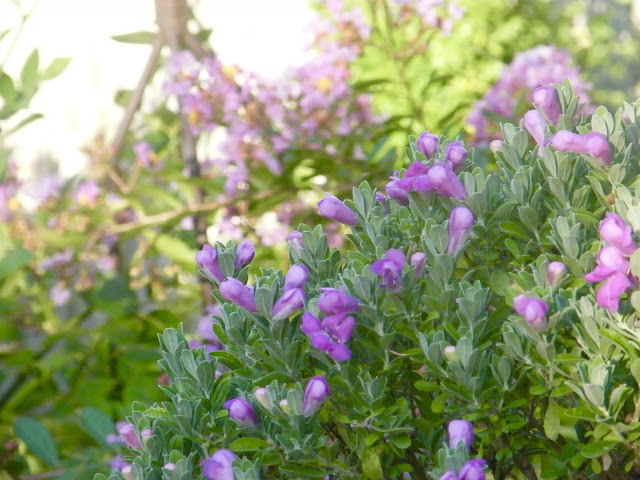 In my experience, it does not bloom heavily until mid-late June, possibly because of its location; more probably because it is just now reaching true maturity, and the blooms are coming in greater numbers. 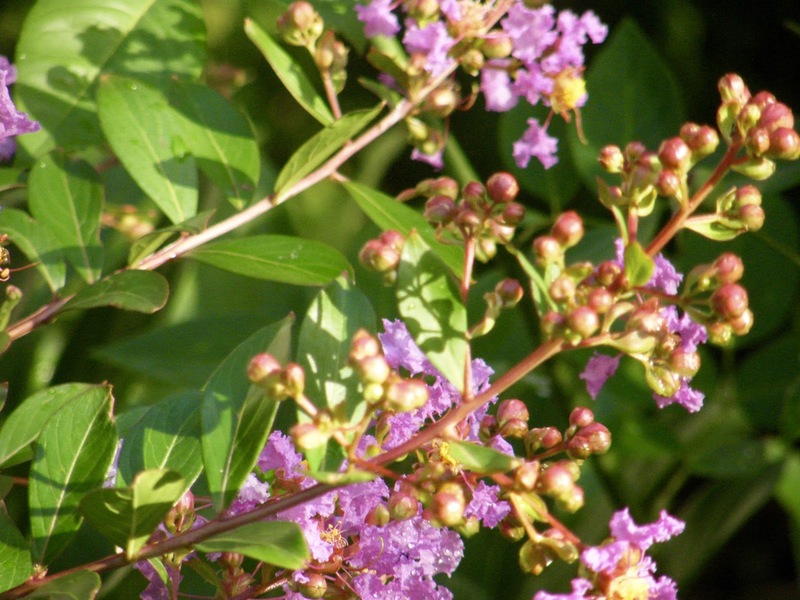 Mature height is 5-8', 4-6' wide; blooms its head off for three months and is hardy zones 7-10. The collection offers three colors: lavender, pink and white. Watch this SOUTHERN LIVING COLLECTION youtube video (here) to see images of each color. 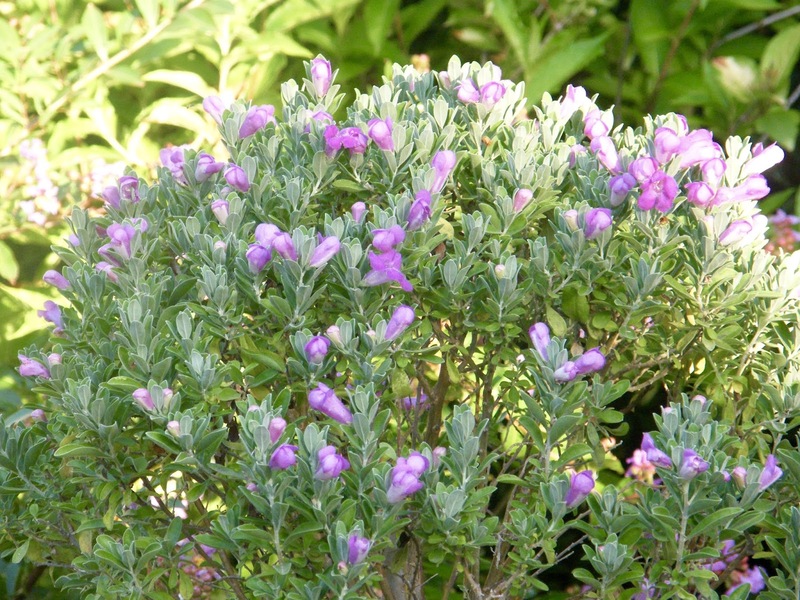 Color can appear pink to purple to lavender depending on time of day and what it is planted with. A Silverado Sage topiary blooms in front of two Early Bird Crapes with sedum 'Autumn Joy' in the foreground. I am a gal who can faint over a great color echo in the garden. 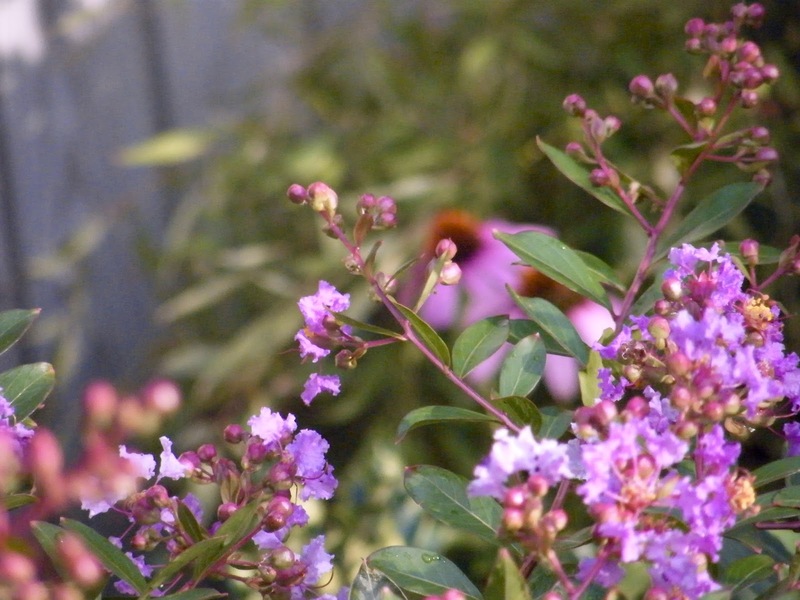 And in my garden, the Early Bird Crape Myrtle in Lavender coupled with Echinacea Purpurea and the like-colored blooms on my Silverado Sage topiary are truly swoon worthy. Happy circumstance that they all like the same growing conditions and play well together. Perfect color echo between purple coneflower and lavender crape myrtle. and in the morning light, looking pale lavender-blue. 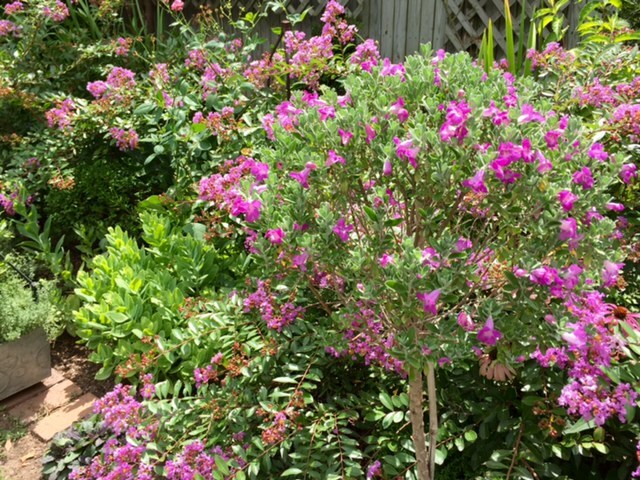 Beautiful gray foliage of Texas Sage with hot pink blooms. I love the dome-shaped head of a topiary. 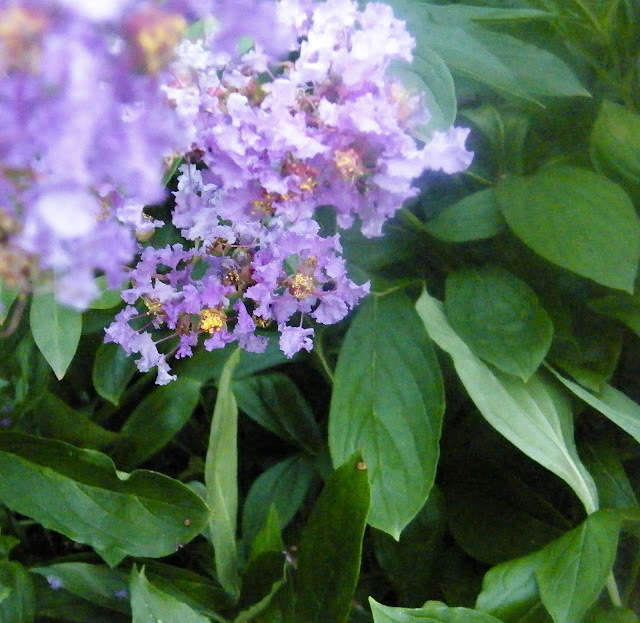 The textures of both leaf and bloom are soft and velvety. Notice the unblemished peony foliage below the lavender flower head. 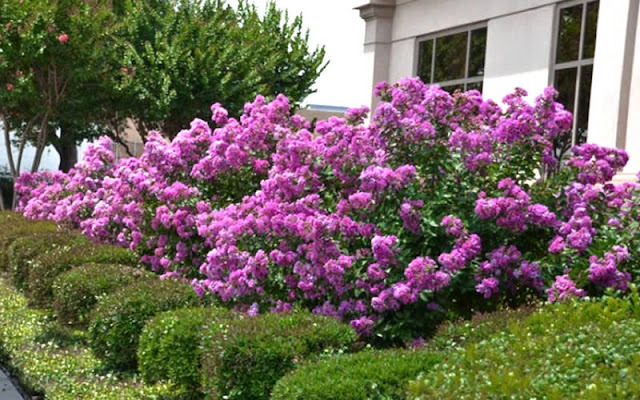 When I shape and prune the crape myrtles in late winter/early spring (as the peonies begin to flush out and come into their own blooming season) , I will take the crape's protective nature into account. Ah the genius of multi-season planting for multi-seasonal bloom. Something I am still learning as a long-time gardener. 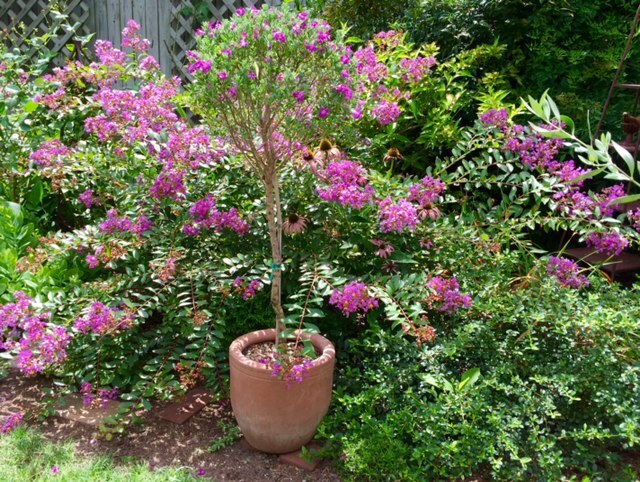 The Grumpy Gardener from SOUTHERN LIVING has more to say on the topic of semi-dwarf crape myrtles here on the Daily South. 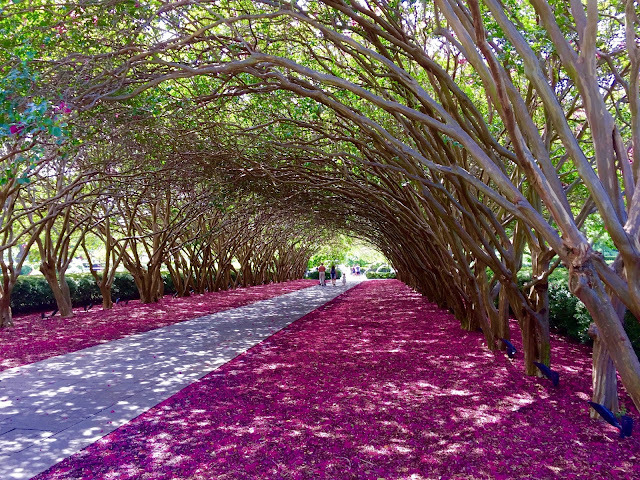 The magnificent allee of Crape Myrtles at the Dallas Arboretum and Botanical Gardens provides more than enough shade for Husband and other garden strollers.